"Hitman (video game)" redirects here. For the first game in the series, see Hitman: Codename 47. For the 2016 video game, see Hitman (2016 video game). Hitman is a stealth video game series developed by the Danish company IO Interactive, previously published by Eidos Interactive and Square Enix. IO Interactive remained a subsidiary of Square Enix until 2017, when Square Enix started seeking sellers for the studio, IO Interactive completed a management buyout, regaining their independent status and retaining the rights for Hitman, in June 2017. The series is available on Microsoft Windows as well as several video game consoles, including the PlayStation 2, Xbox, GameCube, PlayStation 3, Xbox 360, PlayStation Vita, PlayStation 4 and Xbox One. The franchise also includes two novels and a graphic novel: Hitman: Enemy Within written by William C. Dietz, followed by Hitman: Damnation written by Raymond Benson, as well as a comic prequel Agent 47: Birth Of A Hitman. A film adaptation in 2007, which is loosely based on the storyline of the games, was negatively received, but became a financial success. Another film, Hitman: Agent 47 was released in 2015, to negative reviews. The story revolves around Agent 47, a cloned assassin-for-hire, whose flawless record places him in high demand among the wealthy and elite. The first original scriptwriter was Morten Iversen, who wrote the scripts for Hitman: Codename 47 and Hitman 2: Silent Assassin. He also contributed to Hitman: Contracts and Hitman: Blood Money. The games feature a mix of orchestral and electronica musical scores, composed by Jesper Kyd. A fifth installment of the series, Hitman: Absolution, was released on 20 November 2012. With it, a spin-off has been released for PC, PlayStation 3 and Xbox 360 called Hitman: Sniper Challenge. For mobile and tablet, a spin-off game developed by Square Enix Montreal was released as a turn-based strategy game, titled Hitman Go. Another game released for mobile, Hitman: Sniper, consists of first-person sniping gameplay. The sixth game, titled Hitman, was released episodically, the first episode of which released in March 2016, and the last in December 2016. The seventh game, Hitman 2, was released in November 2018. The first game starts when 47 escapes from a sanitarium where he has seemingly been imprisoned, being guided by a mysterious overseer. After a year, he is shown to be working for the covert International Contract Agency, or ICA, under his handler Diana Burnwood. He is sent on a mission to eliminate four crime bosses across the world, before being hired to kill a fifth target, Doctor Kovacs, at the sanitarium where 47 was imprisoned. As events transpire, 47 finds out that all his targets were part of an advanced cloning experiment, with him as the result; the perfect assassin. Professor Ort-Meyer, himself the scientific head of the experiments, is revealed to be the client who ordered the hits and, to protect himself, sends a squad of docile, highly trained 48 clones against 47. With help from a fellow agent, 47 defeats the clones and kills Ort-Meyer. In the aftermath of this revelation, 47 tries to leave his assassin past behind (in Hitman 2: Silent Assassin), seeking peace in a Sicilian monastery, but is forced to become an assassin when his mentor and friend, Father Vittorio, is kidnapped. Getting back in contact with the ICA, he arranges with Diana that he will work for them if they help trace Father Vittorio. Eventually, it is revealed that Father Vittorio's kidnapping was orchestrated by Sergei Zavorotko, the brother of one of the men whose DNA helped create 47, to bring 47 out of retirement and kill everyone who was in on a deal by Zavorotko to purchase a nuclear warhead. 47 successfully infiltrates Father Vittorio's monastery, killing Zavorotko and all his men. Though Father Vittorio begs 47 to lead a good life, the assassin decides to return to the ICA full-time. A few years later, by the time of Hitman: Blood Money, 47's reputation has spread far and wide, with a large list of clients requesting his services. During the course of the game, it becomes clear that the ICA is under attack from a rival agency called the Franchise, who are planting incriminating evidence against 47 through one of their agents, Alexander Leland Cayne. Eventually, the agency is depleted to the point that Diana and 47 are the only ones left. 47 himself is nearly killed in Paris France, prompting flashbacks over previous missions. Eventually, 47 kills one of the two Franchise assassins and is given a final contract by Diana, who has dissolved the ICA, to take down the Franchise. Soon, an old acquaintance of 47, former CIA agent Smith, reveals that the Franchise, planning to assassinate the US president, is merely a puppet organization for Alpha Xerox, a shadowy political organization who wish to monopolize the cloning techniques that gave birth to 47: they wish to kill the President before he can put a halt to their plans. 47 prevents the assassination, but must go into hiding from the Franchise and the police. At his hideout, he is seemingly betrayed and poisoned by Diana, with the Franchise preparing to cremate the assassin so his DNA cannot be used for further cloning experiments. 47's 'death' is later revealed to be a tactic which would bring 47 within killing range of everyone at the funeral, including Franchise agent Cayne. 47, his identity now a secret, goes into hiding and Diana uses the remains of the Franchise to revive the ICA. Years later, in Hitman: Absolution, Diana seemingly betrays the ICA, exposing it to the public. When the Agency learns of her betrayal, they send operatives to eliminate her. During a mission, Diana is forced to suddenly abandon 47 when she sees that the Agency operatives are coming for her. Due to her sudden disconnection from him, 47 is nearly killed during the mission and decides to cut contact with the ICA. The Agency is eventually able to locate 47 once again. Benjamin Travis, who is Diana's superior within the Agency, contracts him to kill Diana and bring a girl she has in her care, Victoria, to the Agency. 47 infiltrates Diana's base and shoots her, but promises to keep Victoria safe from the ICA. It is revealed that Victoria is a clone, like 47, created in secret by Travis, whom the ICA would train to be an assassin. Diana did what she did to protect the girl from becoming like 47. The assassin soon comes into conflict with Blake Dexter, the head of Dexter Industries and a top figure in the criminal underworld, who wishes to sell Victoria to the highest bidder. 47 finds himself fighting to keep Victoria safe as she is hunted by Dexter's forces and the ICA. 47 eventually kills Dexter and his conspirators along with Travis and his lieutenants, saving Victoria. At the end, it is revealed that 47 spared Diana and it is implied that she and 47 are once more working for the ICA. In Hitman, the game's prologue reveals 47's recruitment into the ICA and his first meeting with Diana. While Diana is impressed with 47's skills as a silent assassin, training director Erich Soders believes that 47 is too dangerous as they could find nothing on his background check that gives the ICA any leverage over him. Soders rigs 47's final test so that it would be impossible to complete on his own, although Diana learns of Soders plot and in turn assists 47 in completing the test. Though angered by Diana's actions, Soders reluctantly makes 47 an agent and assigns Diana as his handler. Twenty years later, following the events of the previous game, 47 is sent to Paris to eliminate fashion mogul Viktor Novikov and his partner Dahlia Margolis, who are secretly the ring leaders of the international spy ring IAGO. After completing the contract he is sent to Sapienza, Italy to eliminate the wealthy bioengineer Silvio Caruso and his Head of Lab Francesca DeSantis who both work for the Ether Bio Corporation and to destroy a genetically engineered virus that targets an individual unique DNA signature. Later, 47 is sent to Marrakesh, Morocco to eliminate Claus Strandberg and General Zeydan, who are planning to overthrow the Moroccan government. A contract is then issued on an assumed murderer, Jordan Cross and his family’s lawyer Ken Morgan in Bangkok. Diana then reveals that there’s been a “shadow client” the entire time, operating out of Colorado. 47 proceeds to eliminate the lieutenants of the shadow client and discovers evidence that he has been using 47 to hunt members of Providence, a group of global elites who rule the world in secret. 47 also discovers that Erich Soders is a Providence double agent. Realizing his betrayal, 47 is sent to Hokkaido to eliminate Soders and another Providence operative, Yuki Yamazaki. The final cutscene of season 1 shows a Providence operative discussing a partnership with the ICA to track down the shadow client. In Hitman 2 (2018 video game), 47 is sent to New Zealand to kill Alma Reynard, one of the Shadow Client's lieutenants, and search her house for information on the Shadow Client. 47 receives information connecting CEO of Kronstadt Industries, Robert Knox, and his daughter, Sierra Knox, to the Shadow Client, and Providence, impressed with their work, authorizes them to eliminate the rest of the Shadow Client's milita, as their attacks on CEOs are causing a global panic. 47 is then sent to Miami to kill the Knoxes, who defected from Providence to the Shadow Client after becoming paranoid about the attacks. After they have been eliminated, the Shadow Client is revealed as Lucas Grey, who attempts to fulfill his own plans along with hacktivist Olivia Hall and insists that they need 47's help to take down Providence. 47 is then sent to Colombia to assassinate drug kingpin Rico Delgado and two other members of the infamous Delgado cartel. After the mission, Diana has flashbacks of her parents being killed in a car bombing. It is revealed that the cartel had been creating fake IDs for the Shadow Client's milita, and 47 is sent to Mumbai to find and eliminate The Maelstrom, the Shadow Client's second lieutenant, as well as two other sea pirates that killed a Providence operative. Grey's location is traced to Romania at the facility where 47 was created. 47 encounters Grey, who reveals himself as Subject 6. As children, he and 47 had attempted to escape Dr. Ort-Meyer's facility, but only Grey succeeded, and 47 had his memory wiped. 47 then remembers that he and 6 made a pact that they would take revenge on whoever made them into assassins, and this prompts a meeting between 47, Grey, Diana, and Hall in Berlin. Grey reveals that Ort-Meyer was a member of Providence which is controlled by "The Constant" and three families known as "The Partners". Grey's only lead on the Constant is that 47 knows the identity of the Constant. After being injected with the antidote to the memory wiping drug, 47 reveals that the first Constant is an ex-KGB spy named Janus who currently resides in a quiet Vermont suburb. Diana then files a false ICA report claiming Janus is the Shadow Client and that Grey is just a subordinate, giving 47 permission to infiltrate the suburban town and kill Janus and his top bodyguard, Nolan Cassidy, and to search for clues about the Constant's whereabouts. While in Vermont, 47 finds evidence Janus and the Constant were planning to meet at an annual gathering held by a group of the global elite known as "The Ark Society" that has ties to Providence. Hall reveals that the gathering is being held on the Isle of Sgail in the North Atlantic, but the Constant, revealed as the man who hired Diana at the end of Hitman, has implanted himself with a suicide chip that releases lethal poison into his body if he is compromised. 47 is then tasked to eliminate Zoe and Sophia Washington, the chairwomen of The Ark Society who hold the kill-switches for the poison chip, and to assist Grey in extracting the Constant from the island. The game leaves off with the Constant revealing the names of the Partner families and by taunting Diana about what she does not know. In a cutscene, it is revealed that 47 was the one contracted with killing Diana's parents. The core objective in each level is to kill assigned targets (usually multiple and sometimes additional targets as an optional bonus). In most cases, Hitman allows the player different options to accomplish this task. Players can perform precise assassinations or slaughter indiscriminately in order to achieve the mission goals; however, the games reward a subtle approach by awarding special weapons or cash bonuses if players earn a favourable rank (usually achievable by eliminating only the assigned target, and without raising the alarm doing so). 47 can wear a variety of disguises (such as repairmen, police officers and waiters) to fool enemies and gain access to restricted areas. The focus of Hitman is not hiding in the shadows from the enemy, but rather blending in amongst them. It is up to the player to initiate violence, since guards do not usually open fire unless provoked. In every game, the player character, Agent 47, has limited maneuverability; he cannot jump, scale walls, or mantle up ledges (there are a few pre-scripted places where he can jump from one balcony to another, but these are very rare). This generally limits the player to a single plane of movement, although he is often presented the opportunity to move to higher or lower areas through the use of ladders, stairs, elevators, or hills. Agent 47 is given the ability to hop over minor obstructions in Blood Money, and can climb certain edifices (such as fencing, vines, loose bricks, crates etc.). There is also the option of climbing onto the top of elevators through the hatch, allowing the player to strangle a victim from above. A major feature in the game is the tension meter or "Suspicion Meter", detailing how much attention or suspicion the player is receiving from the public or guards and is dependent on many things. For example, walking around in a guard's uniform with the correct corresponding gun will not gather much notice, whereas running around in a waiter's uniform in a restricted area while carrying a visible weapon instead of an appetizer tray will result in an unwanted confrontation with the guards. The second game of the series, Silent Assassin, enforced the concept of kills without firing more than a single shot. As per the number of shots fired and stealth used, ratings were given after every mission. The best of these ratings was Silent Assassin, indicating no more than one shot per target (and a guard) with no alerts raised. Replacing a World War I replica gun to be used in the opera Tosca with a real World War I era pistol. Crushing a man's neck using weights during his morning workout. Rigging a grill to set a victim on fire. The Hitman series permits the player to kill targets (or non-targets) in a variety of ways, using firearms, melee weapons, or conventional objects that 47 picks up (such as shovels, fireplace pokers, pool cues, etc.). In Hitman: Contracts, melee weapons such as knives can be used to kill in more than one method, including forward stabs, horizontal throat slitting, frontal slashes, repeated stabs under the ribcage, or thrusting the blade into the carotid artery. 47 also has a garrote, or fiber wire. The fiber wire is specially made for strangulation, with reinforced handles. He carries it with him on every mission, even those in which he is stripped of all other weaponry. It is also one of the few weapons which can bypass metal detectors. To achieve the ideal 'Silent Assassin' rank, it is required that 47 only kills his assigned targets, and few or no other NPCs. The sedative syringes, or chloroform in Hitman 2: Silent Assassin (which only has a temporary, dose-dependent effect, unlike syringes), exist for this purpose, so that 47 may incapacitate an innocent person to take items or clothing from their body without harming them, so it does not count against the player in the final ranking. In Blood Money, the ability to add sedatives to food and drink was added, to avoid direct confrontation. Blood Money also introduced the option to hold any NPC hostage using smaller arms and use them as a human shield, and allows the player to knock the hostage unconscious with the gun, saving the player sedatives for food items or any impeding characters that are seated in chairs. In some missions, if a murder can be made to look like accidental death (using the accident system introduced in Blood Money), some kills will not be counted as hits, but as accidents. Any civilians or armed personnel who witness a kill will count as witnesses, and will harm the player's rank if they remain alive or alert nearby guards. If however, someone (target or civilian) dies because of an accident, it will not matter if there are witnesses. 47 has the option of killing witnesses before they reach a guard, but the unnecessary murder will still count against his rank, unless he kills them with an accident. Witnesses also include anybody who sees 47 changing disguises or holding a weapon. In the games prior to Blood Money, the only consequence of having witnesses to a crime is that they will seek out police/guards and trigger an alert. There are mission-specific options for killing a target in certain levels. Notable examples include locking a target in a sauna to stimulate a heart condition and cause cardiac arrest, poisoning a target's meal (this becomes more widespread in Blood Money), disguising 47 as a doctor and sabotaging a surgical operation, replacing a prop Mauser C96 handgun with a real one at an opera rehearsal, causing an actor to unwittingly kill the target, and causing stage pyrotechnics to explode and set the target on fire. In most cases, it is required that 47 also hide the body of killed or unconscious victims, in order to avoid any unwanted alarm or if this is the desired effect 47 can leave the victims body in a wide open space for all to see. The Hitman insignia, a stylized fleur de lis, appears in Hitman: Codename 47 on the gates of Prof. Dr. Otto Wolfgang Ort-Meyer's asylum, throughout his laboratory and is formed by Ort-Meyer's pool of blood when 47 kills him at the end of the game. It also appears in 'Hitman: Contracts' on the floor of the cloning lab, this time as though it is the actual floor design, as well as on Ort-Meyer's belt buckle. In Blood Money, it appears on books throughout the levels as an easter egg. The symbol is engraved on the handles of his custom AMT Hardballer pistol; they are referred to as 'Silverballers' in Hitman: Contracts, Hitman: Blood Money and Hitman: Absolution. After Hitman: Contracts, the symbol is on the slides as well. It is also found on 47's equipment such as his laptop, briefcase and cell phone. In the film, 47 wears a pair of silver cufflinks with his insignia enameled in red. Agent 47: A genetically-engineered assassin created from the recombinant DNA of five of the world's most dangerous criminals. The fact that the DNA came from multiple ethnicities allows 47 to blend in to a certain degree in most places in the world, or at least not look immediately suspicious and out-of-place. His name comes from the last two digits of a bar code on the back of his head – 640509-040147. According to Jacob Andersen, lead designer of Hitman 2: Silent Assassin, Agent 47 went from being "a mean old hairy guy" to having "hi-tech glasses" before getting to his current design. More inspiration came from "comic books, Hong Kong movies," and other similar media. According to game director Rasmus Højengaard, the idea of a clone whose future is decided by the people that created him, intrigued the Hitman team. Højengaard felt the idea of creating the "ultimate assassin" by cloning "evolved with the character before the first Hitman game was done". David Bateson has voiced 47 in every Hitman game to date. Diana Burnwood: 47's handler at the Agency. Diana briefs 47 on his assignments, oversees his progress, and serves as his guide over the radio. For the vast majority of the series, 47 never sees Diana, recognising her only by voice, however, they do come face-to-face at the conclusion of Hitman: Blood Money and Hitman: Contracts. Although Diana usually handles 47's affairs from afar, she turns out to be a major character in Hitman: Blood Money; serving as a double agent, faking 47's death, saving the Agency from liquidation, and dodging death herself a few times. In the end, her efforts pay off when the Agency is brought back online. In Hitman: Absolution, she is shot by 47 in her home after betraying the agency. Although presumed dead, it is later revealed that 47 had only non-lethally wounded Diana, allowing her to fake her own death. She returns as 47's handler with the ICA in the 2016 Hitman game. She also presumably continues to care for Victoria, a young girl that she and 47 both rescued from the ICA and other captors. In the 2007 Hitman film, Diana's only form of contact with 47 is through a synthesized voice via laptop. However, she does directly call 47 by phone in order to warn him that the Organization has targeted him. In Hitman: Agent 47, Diana is portrayed by Angelababy. Diana is voiced by Vivienne McKee from Hitman: Codename 47 until Hitman: Blood Money, Marsha Thomason in Hitman: Absolution and Jane Perry in Hitman™. Agent Carlton Smith: A fairly inept American CIA agent with ties to the Agency. He has a tendency to be captured and tortured by the people he has been assigned to spy on. As a result, the Agency has sent 47 to rescue him on a number of occasions. His torture experiences have caused him to take up drinking on the job, making him even more ineffective. Like 47, Agent Smith dons a variety of disguises, but most often he's seen beaten and stripped down to his American Flag boxer shorts. He seems to regard 47 as a friend, no doubt because 47 has rescued him so many times. The feeling is not mutual. 47 initially treats his relationship with Agent Smith as detached and professional, but as he is forced to rescue Smith again and again, he increasingly sees Smith as a hindrance. In Hitman: Blood Money, 47 puts a gun to Smith's head and threatens to kill him, but in the end didn't as Smith provides him a job which will then lead to the White House assassination. Smith's appearance changes somewhat in Hitman: Blood Money, having lost most of his hair through long term alcoholism and depression. In the Hitman film, Smith is instead portrayed as a very competent and dutiful CIA agent. In return for assassinating a high priority CIA target (Udre Belicoff, the brother of 47's original target), Smith helps 47 elude arrest by Interpol. Mei-Ling: A young woman from the Chinese mainland, abducted and recruited into the brothel of Hong Kong crime lord Lee Hong. 47 rescues her in exchange for information about her employer in preparation for assassinating him. After escaping from Lee Hong, Mei-Ling is later revealed to be prostituting herself to Hayamoto, another Asian crime lord. 47 ends up rescuing her again (much to his consternation). Mei-Ling is apparently the first woman who has ever kissed 47; his reaction is different in the original game from the remake. In the original Hitman: Codename 47, 47 reacts with significant revulsion. In the remake Hitman: Contracts, his reaction is one of detached bemusement. She was known as Lei Ling in the original game. Dr. Otto Wolfgang Ort-Meyer: 47's creator and the ultimate antagonist of Hitman: Codename 47. A brilliant but unhinged individual ostracized by the scientific community for his radical theories on genetic manipulation, Ort-Meyer ran a sophisticated lab hidden beneath a Romanian asylum. There he labored on DNA splicing in an effort to create a flawless human being. He took a great part in raising and indoctrinating 47 at the asylum, where 47 was kept a prisoner until he matured. Ort-Meyer eventually engineered 47's "escape" from the asylum in order to test his performance in the real world. The consummate megalomaniac, Ort-Meyer contracted with the Agency to have 47 kill the other 4 men behind the Hitman Project (47's "fathers"), so that Ort-Meyer could enjoy the fruits of his labor by himself. Ort-Meyer then attempted to lure 47 to his death, having perfected "No. 48", an improved, mindlessly loyal clone. However, Ort-Meyer underestimated how far 47 had advanced. In the final showdown, 47 slaughtered 48 and the clones, then killed Ort-Meyer himself by snapping his neck. As of 2019, seven games had been released, all of them developed by IO Interactive. As of March 2013, the games had sold a combined 8 million units. It is an action-adventure stealth-based video game series, although it is possible to switch between third-person and first-person perspective except in Hitman: Codename 47, which offers an optional camera angle comparable to one used in fixed-camera adventure games, and the games from Hitman: Absolution onward, which exclusively employ a traditional, over-the-shoulder camera angle identical to video games such as Resident Evil 4. The series has received a generally positive reception and shipped over 15 million copies worldwide, as of 2015. The first installment in the Hitman series revolves around a test subject known as 47 escaping the asylum where he had been experimented on all his life and being employed by the Agency. 47 meets his handler, Diana Burnwood, who assigns him to kill four criminal masterminds and then a doctor who is revealed to be the one who treated 47 at the asylum. 47 learns that he is a clone who has been trained since birth to become an assassin. The four criminal masterminds that 47 killed were part of the cloning experiment and their deaths were ordered by Professor Wolfgang Ort-Meyer, the one behind the entire cloning process. Ort-Meyer planned 47's escape, so he could have 47 kill the other four associates and use 47 for his own purposes. 47, with the help of a CIA agent named Carlton Smith, returns to the asylum and plans to kill his creator. Ort-Meyer, having prepared for 47's return, sends his group of clones to kill 47. The clones fail their duties and 47 confronts Ort-Meyer. 47 shoots Ort-Meyer, then snaps his neck, killing him. After murdering Dr. Ort-Meyer, Agent 47 has faked his death and unofficially resigned from the ICA, leaving behind his life as an assassin, and retreated to a church in Sicily to seek peace. He works as a gardener for Father Vittorio, his best friend and mentor. 47 attends a confession to admit his sins, but Vittorio understands and believes 47 is decent at heart. One day, while 47 is working in a garden, Father Vittorio is kidnapped and a ransom note is left for 47. 47 decides to go back to his old job as an assassin to track down Father Vittorio. He contacts his agency, who thought he was dead, and makes a deal with his handler, Diana Burnwood. He states that he will return to his post as an ICA assassin if the agency can help him locate Father Vittorio. They accept the deal. Diana informs 47 that Father Vittorio was kidnapped by a Sicilian Mafia boss named Giuseppe Giuliano. The man is holding the priest in a cell under his mansion, dubbed Villa Borghese. 47 infiltrates and kills Giuliano, but fails to find Vittorio. 47 is later told by Diana, that a satellite image shows Father Vittorio being taken away by 'Russian-looking types in uniform'. 47 works with the Agency to repay their attempt to find Vittorio, and eventually saves him. As 47 realizes that he cannot find inner peace, 47 leaves the church and narrates that he can never retire in safety and must return to his life as an assassin. The game begins with a cutscene showing a wounded Agent 47 wandering through a dark hotel corridor and entering his room. He collapses and begins to have flashbacks regarding previous assassinations he committed, beginning with the aftermath of killing Dr. Ort-Meyer at the end of the first Hitman game. The missions are primarily focused on replays of previous missions in the original game, except played in reverse. The graphics, maps and artificial intelligence have been customized and improved. In the game, 47 visits several locations, including Romania, Kamchatka, the United Kingdom, Rotterdam, Budapest, Hong Kong, and finally Paris. Each mission is framed around the killing of one or more individuals, which the main protagonist, Agent 47 must accomplish. Standing between him and success are armed guards, security checkpoints, possible witnesses and other obstacles. The player guides 47 through the game's levels with the help of a satellite map which can be accessed at any time. The map indicates the layout of each topographical area of the level, the whereabouts of 47 's main targets, and other AI-controlled characters. In order to carry out his mission, 47 may use any method at his disposal to eliminate his targets, regardless of witnesses or violence done to bystanders. Beyond rewarding stealth over bloodshed as is traditional in the series, Blood Money includes features that directly penalize the player for making too much noise and/or being too violent; either toward their targets, bystanders, or both. Hitman: Absolution was announced by Square Enix and it was released on 20 November 2012 worldwide for Microsoft Windows, OS X, PlayStation 3 and Xbox 360. The fifth installation in the series offers a few different angles from which to observe surroundings. Square Enix Montreal, which was originally working on the next Hitman title, will focus on developing smartphone and tablet versions of Hitman and other games. On 15 June 2015, a full reveal of the game took place at Sony's E3 2015 press conference. Titled Hitman, the game was released in March 2016 for Microsoft Windows, PlayStation 4 and Xbox One. Hitman 2 was announced in June 2018 by IO Interactive and Warner Bros. Interactive Entertainment, the latter of which will be publishing the game following IO's acquisition of the Hitman IP from Square Enix. The game was released on Windows, PlayStation 4, and Xbox One on November 13, 2018. Unlike the 2016 Hitman game, Hitman 2 is not episodic in nature. Hitman Go is a turn based puzzle video game developed by Square Enix Montreal. The game was released for iOS on 17 April 2014, and for Android on 4 June 2014. The Microsoft Windows and the Windows Phones version of the game was released on 27 April 2015. The PlayStation Vita and the PlayStation 4 version of the game was released on 23 February 2016. Hitman: Sniper is a first-person shooter developed by Square Enix Montreal. It was released for iOS and Android on 4 June 2015. A compilation called Hitman Trilogy (Hitman: The Triple Hit Pack in Europe) was released for PlayStation 2 on 19 June 2007 in North America and on 22 June 2007 in Europe. It's a box set containing three games, which are Hitman 2: Silent Assassin, Hitman: Contracts and Hitman: Blood Money. The games are identical to their original stand-alone releases. The compilation was later released for PlayStation 3 and Xbox 360 called Hitman HD Trilogy and was released on 29 January 2013 in North America, 31 January 2013 in Australia and 1 February 2013 in Europe. The purpose for the release of the three Hitman games is to introduce new players to the series, as well as release Hitman: Blood Money on PlayStation 3 (the game had a prior stand-alone Xbox 360 version). A digital bundle was also released for the Xbox 360 titled Hitman HD Pack, containing just Hitman 2: Silent Assassin and Hitman: Contracts. Another compilation box set was released for PlayStation 4 and Xbox One on 11 January 2019 worldwide through the PlayStation Store and Xbox Store containing two games, which are Hitman: Blood Money and Hitman: Absolution. Both of these games were remastered in 4K for those specific consoles. A film adaptation of the game was released in 2007. The film, Hitman, is set in a separate continuity from the game series. In the film, the Agency is replaced by the Organization. Like the Agency, the Organization benefits from ties to various government agencies, is neutral in global affairs and morality, and performs missions all over the world. Unlike the game wherein the hitmen are contracted from a range of backgrounds, the Organization instead recruits orphans and trains them from an early age. On 5 February 2013, it was reported that the film series was being rebooted with the title Hitman: Agent 47. Paul Walker was attached to star with director Aleksander Bach helming the project as his directorial debut. Screenwriter of the original film, Skip Woods, wrote the screenplay with Mike Finch. On 9 January 2014, actor Rupert Friend replaced Walker as the main character after Walker's death on 30 November 2013. On 31 January, Zachary Quinto joined the film in a supporting role. On 5 February 2014, Hannah Ware also joined the film to play the female lead. On 6 March 2014, Thomas Kretschmann signed on to play the high-profile villain role in the film, Le Clerq. On 13 March 2014, Dan Bakkedahl joined the cast of the film. On 14 March 2014, Ciarán Hinds signed on to star in the film as a scientist. In 2015, Hitman film producer Adrian Askarieh stated that he hoped to oversee a film universe with Just Cause, Hitman, Tomb Raider, Deus Ex, and Thief, but admitted that he does not have the rights to Tomb Raider. In May 2017, the Game Central reporters at Metro UK suggested that the shared universe was unlikely, pointing out that no progress had been made on any Just Cause, Deus Ex nor Thief films. In November 2017, it was announced that streaming service Hulu was developing a television series, based on the Hitman series of video games, with a pilot script written by John Wick creator Derek Kolstad. In 28 December 2011 the web series appeared called "Hitman 101". This series told the story of the man who seemingly was contracted via ICA to kill 5 people in one week. The series contain of twelve 25 minutes episodes and two extras. In 2012 the series was one of the top ten series chosen as an Official Selection to the prestigious Marseille Web Fest 2012 as well as being a 2012 Leo Award Nominee. ^ Osborn, Alex (17 June 2017). "E3 2017: IO Interactive Officially Goes Indie, Gains Full Rights to Hitman IP". IGN. Retrieved 15 April 2018. ^ C., Dietz, William (2007). Hitman : enemy within. New York: Del Rey/Ballantine Books. ISBN 9780345471321. OCLC 149573908. ^ 1955-, Benson, Raymond, (2012). Hitman : damnation. New York: Del Rey. ISBN 9780345535856. OCLC 821224008. ^ Square-Enix, IO Interactive. "Hitman". Archived from the original on 7 June 2015. Retrieved 15 October 2016. ^ "Hitman changes release structure again, now 'fully episodic'". Polygon. Vox Media. Archived from the original on 14 January 2016. Retrieved 14 January 2016. ^ "Hitman 2 will introduce co-op assassinations this November". The Verge. Retrieved 4 July 2018. ^ "Hitman 2 Interview – ( Review, Preview, Article, Interview, Q&A )". Archived from the original on 4 March 2016. Retrieved 15 October 2016. ^ a b c "GamesRadar+". Archived from the original on 19 September 2009. Retrieved 15 October 2016. ^ "Businesses – Square Enix Holdings". 31 March 2011. Archived from the original on 25 March 2012. Retrieved 25 March 2012. ^ "Square Enix 2015 Annual Report" (PDF). Square Enix. October 2015. Retrieved 11 January 2019. ^ "Hitman: Codename 47 Reviews". Metacritic. Retrieved 6 May 2017. ^ "Hitman 2: Silent Assassin Reviews". Metacritic. Retrieved 6 May 2017. ^ "Hitman: Contracts Reviews". Metacritic. Retrieved 6 May 2017. ^ "Hitman: Blood Money Reviews". Metacritic. Retrieved 6 May 2017. ^ "Hitman: Absolution Reviews". Metacritic. Retrieved 6 May 2017. ^ "Hitman Reviews". Metacritic. Retrieved 6 May 2017. ^ "Hitman 2 Reviews". Metacritic. Retrieved 6 May 2017. ^ "SCi reveals new Hitman". Gamespot UK. 27 September 2007. Archived from the original on 24 January 2013. Retrieved 16 December 2008. ^ "Page 17 of SCi Entertainment Group Plc Annual Report 2007" (PDF). SCi Entertainment Group Plc. Archived (PDF) from the original on 5 August 2015. Retrieved 6 February 2008. 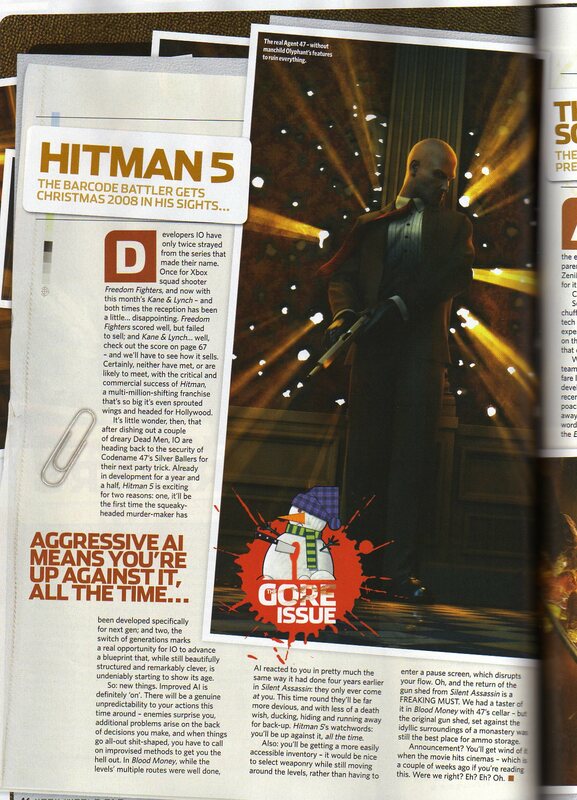 ^ "Magazine scan of Hitman: Absolution reveal" (JPG). Xbox World. 9 December 2007. Archived from the original on 17 July 2011. Retrieved 16 December 2008. ^ Lund, Karsten (25 October 2012). "The Future Hitman Game, on a Post-it: Square Enix Montréal". Gamasutra. Archived from the original on 22 October 2013. Retrieved 11 August 2013. ^ Nath, Debabrata (17 June 2013). "Hitman studio face lay-offs, nearly half of the staff lose jobs". VG247. Archived from the original on 24 August 2013. Retrieved 11 August 2013. ^ Cowan, Danny (17 June 2013). "Report: IO Interactive cancels projects, loses half of staff to layoffs". Joystiq. Archived from the original on 28 July 2013. Retrieved 11 August 2013. ^ Matulef, Jeffrey (17 June 2013). "IO Interactive cancels everything that isn't Hitman, including Kane & Lynch". Eurogamer. Archived from the original on 20 August 2013. Retrieved 11 August 2013. ^ Usher, Anthony (21 June 2013). "Square Enix Montréal working on smartphone and tablet versions of Hitman and 'other brands'". Pocket Gamer. Archived from the original on 23 June 2013. Retrieved 11 August 2013. ^ Cocke, Taylor (21 June 2013). "Square Enix Leadership Changes, Focus Shifts From AAA to Mobile". IGN. Archived from the original on 21 July 2016. Retrieved 11 August 2013. ^ Sheridan, Connor (21 June 2013). "Square Enix Montreal working on Hitman tablet games". GamesRadar. Archived from the original on 22 October 2013. Retrieved 11 August 2013. ^ Scammell, David (23 September 2015). "Hitman delayed to March 2016". VideoGamer.com. Archived from the original on 4 March 2016. Retrieved 23 September 2015. ^ Alexander, Heather (7 June 2018). "Hitman 2 Is Coming Out This November". Kotaku. Retrieved 7 June 2018. ^ "Hitman Go Reviews". Metacritic. Retrieved 6 May 2017. ^ "Hitman Go: Definitive Edition Reviews". Metacritic. Retrieved 6 May 2017. ^ "Hitman: Sniper Reviews". Metacritic. Retrieved 6 May 2017. ^ Suszek, Mike (13 February 2014). "Square Enix announces mobile strategy game Hitman Go". Joystiq. Engadget. Archived from the original on 19 June 2015. Retrieved 28 April 2015. ^ Nunneley, Stephany (10 April 2014). "Hitman GO release date announced, hits iOS devices first". VG247. Archived from the original on 19 June 2015. Retrieved 28 April 2015. ^ Futter, Mike (27 April 2015). "Hitman Go Now Available On PC And Windows Phones". Game Informer. Archived from the original on 28 April 2015. Retrieved 28 April 2015. ^ Matulef, Jeffery (3 June 2015). "Hitman: Sniper is out tomorrow on iOS and Android". Eurogamer. Archived from the original on 19 June 2015. Retrieved 3 June 2015. ^ "Hitman Trilogy Reviews". GameRankings. Retrieved 6 May 2017. ^ "Hitman HD Trilogy Reviews". Metacritic. Retrieved 6 May 2017. ^ "Hitman HD Enhanced Collection Reviews". Metacritic. Retrieved 6 May 2017. ^ a b "Hitman Trilogy". Eidos Interactive. Archived from the original on 14 July 2007. Retrieved 16 June 2007. ^ "Hitman Triple Pack Now Available". GamersHell.com. 22 June 2007. Archived from the original on 29 September 2007. Retrieved 7 July 2007. ^ "Report: Hitman HD Collection Listed by Retailer". ign.com. 1 June 2012. Archived from the original on 15 July 2012. Retrieved 22 July 2012. ^ "Eidos Unveils Hitman Triple Threat". IGN Entertainment. 19 June 2007. Archived from the original on 27 November 2007. Retrieved 22 June 2007. ^ "Hitman HD Pack". Xbox Official Site. Microsoft. ^ Kit, Borys (9 January 2014). "'Homeland' Actor Rupert Friend in Talks to Replace Paul Walker in 'Agent 47'". The Hollywood Reporter. Archived from the original on 12 January 2014. ^ Vejvoda, Jim (18 February 2014). "Exclusive First Look at Rupert Friend as Agent 47 in the Hitman Sequel". Archived from the original on 24 March 2016. Retrieved 15 October 2016. ^ "Zachary Quinto Joins Hitman Sequel Agent 47". 31 January 2014. Archived from the original on 12 February 2015. Retrieved 15 October 2016. ^ Kroll, Justin (5 February 2014). "Hannah Ware Lands Female Lead in 'Agent 47,' Based on 'Hitman' Videogame". variety.com. Archived from the original on 5 February 2014. Retrieved 6 February 2014. ^ Kit, Borys (6 March 2014). "'Avengers 2' Actor to Play Villain in 'Agent 47'". hollywoodreporter.com. Archived from the original on 7 March 2014. Retrieved 7 March 2014. ^ "Dan Bakkedahl Cast In 'Agent 47′". deadline.com. 13 March 2014. Archived from the original on 15 May 2014. Retrieved 14 March 2014. ^ Kit, Borys (14 March 2014). "Ciaran Hinds Joins 'Agent 47'". hollywoodreporter.com. Archived from the original on 21 March 2014. Retrieved 25 March 2014. ^ Krupa, Daniel (9 September 2015). "Hitman producer dreams of shared Square Enix movie universe". IGN. Archived from the original on 20 July 2017. Retrieved 23 June 2018. ^ Game Central staff (12 May 2017). "Thief 5 and movie adaptation in development claims film company". MetroUK. Retrieved 9 December 2018. ^ Fleming Jr, Mike (13 November 2017). "'Hitman' Series In Works At Hulu From 'John Wick' Creator Derek Kolstad". Deadline. Retrieved 13 November 2017. ^ "HITMAN 101 – The Series | A Crime Thriller About The World Of A Hitman | Created by Scott Staven | Made in Vancouver B.C." badguyfilms.com. Retrieved 14 November 2018.